It has been unusually warm across Central Alabama this February. 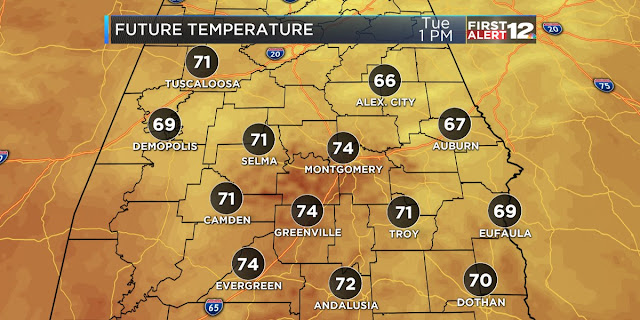 The warmth is breaking several records across the state of Alabama. Not only are we breaking record high temperatures, but the morning temperatures are also breaking records. Anniston, Birmingham, Montgomery, and Tuscaloosa had record high minimum temperatures Wednesday (2/6/19). A record high minimum temperature is basically saying we saw the warmest low temperature ever recorded on that day. According to the Southeast Regional Climate Center, Birmingham is averaging almost 15°F above average for the average temperature for February 1-6, 2019. Record high temperatures were also recorded in Birmingham and Tuscaloosa Wednesday (2/6/19). Birmingham recorded a high of 77°F (25 deg C) which broke the old record of 76°F (24.4 deg C) set back in 1999. Tuscaloosa recorded a high temperature of 80°F (27 deg C) which broke the record of 77°F set back in 1999. Yes. This new " system " of cold is hitting our northern states once again, and once again it comes after temps rebounded to the mid sixties from Montana to the north east states. My friend in Connecticut told me on 2/5-2/6 it was up to 63 degrees just four days after being in the single digits! This is a definite pattern placing credence to geoengineering being applied. If I was to believe in geoengineering it would be something like the events above, in Queensland, Australia which would convince me mankind was involved. After many years of drought and hardship for farmers in this vast area suddenly, a year and a half of rain flood the area in just 7 days, as if the rain was man-made and the people behind the downpour couldn't control the amount and lost control of the experiment. This same overkill happened last winter in California, after years of drought two massive storms in a couple of weeks dumped record amounts of rainfall, resulting in the Oroville Dam crisis. In February 2017, Oroville Dam's main and emergency spillways were damaged from the sheer weight of water, prompting the evacuation of more than 180,000 people living downstream along the Feather River. A similar event happened in a drought-stricken area in New Zealand. What you state is correct. Out of control EXPERIMENT! Exactly!!! You are seeing it, stating these examples IS from geoengineering yes! Why do you dismiss it as you point out this is what would convince you, well it is geoengineering then. You are looking right at what you say would make you a believer and in the same breath you still question these events? Have your snow tested! Why not? The flame test costs nothing and is a good place to begin. Flame on a snowball and little to no melt is not normal or natural, it indicates chemical ice because that no melt result is the chemicals sublimating. It also turns the snowball black! All you need is a bic lighter and a snowball. Lab tests however will give you the exact ingredients and those ingredients match exactly to the patented ingredients in the geoengineering aerosol spray dispersements. Best to you Gary and readers! Exactly correct JR! Aluminum nano particulates are the main ingredient! Nano's are extremely flammable! They are so small you can't see them yet they do create a haze. They are dumping, on purpose, millions of tons of nano aluminum, barium and other harmful heavy metals and chems in to the atmosphere to cover up the warming and control the weather. It is weather warfare! China has admitted, rather proudly, in news that they are using it and making their weather snow and rain. Do people really think USA is not able to do it if China is? Do people really think USA is going to know this about China and is not in on the technology? Come on folks! That is not realistic.